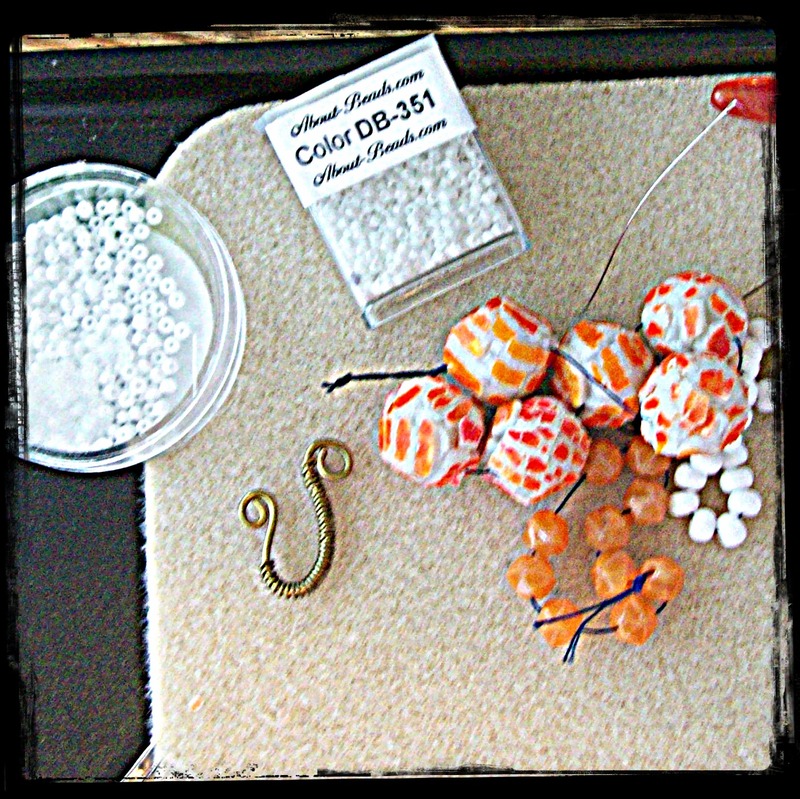 This is my third time participating in the Bead Soup Blog Party and I've really enjoyed it every time. For this round, my partner is Alenka, of Pepita Handmade. She sent me a generous and gorgeous Bead Soup. Over the last few weeks I've not only had the pleasure of playing and creating with these little beauties, but I also made a new friend! Alenka and I have a lot in common and she has shared so many wonderful tidbits about her country, Slovenia. This round for me was definitely enriched by making my acquaintance with Alenka! So without further ado - I here is what I did! So with that in mind, and focusing on that spectacular focal....everything started to fall into place! I mentioned this when I first revealed my soup, but there are such amazing tiny gold flecks in this focal, it really shimmers and shines in the light. Can you see them!? I was happy with the result, but then I really liked it so much more, when I saw how it fell on the chest/neckline when being worn! So then I was left with more beads!!! And since I was loving up those gold flecks, I decided to tackle the red discs next, because they are also covered in those pretty golden flecks. I tried a gold charlotte bezel for them. Unfortunately, it was an epic fail, for when I tried to get around the bezel my needle simply wouldn't go into any of the beads again! Humph! And finally - it was time to contemplate these leftovers! Yabba, dabba DOOO!!!!!! 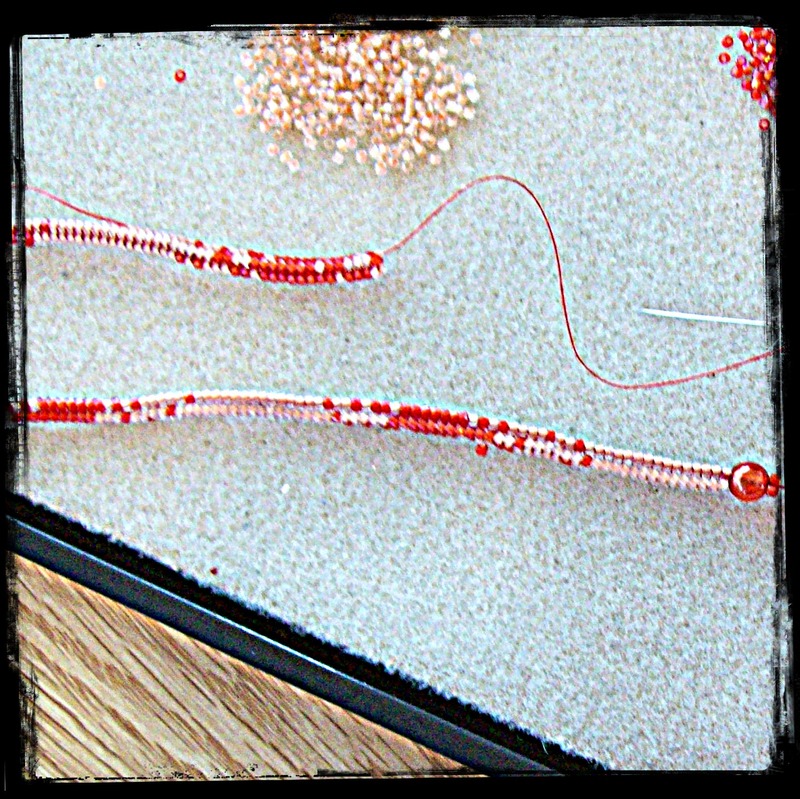 I LOVE these beautiful cracked beads, and I just kept thinking of Wilma Flintstone every time I looked at them! I love the pre-historic feel to them....almost like an archeological treasure has been unearthed! So the only piece I didn't utilize from my soup was the wire hook, but I will certainly use it in another piece, one day soon! Thank you so much for stopping by for the party. Thank you to Lori for hosting this fun event! And thank you again to my awesome partner Alenka! Please be sure to check out all the other wonderful creations in this party by clicking here, or on their links below! I love how you pick the colors for your bead weaving. The necklace looks great! The bracelets look so fun and summery. All your pieces are cute and clever. The colors are so warm and happy. As always your work is great! Amazing, I am in awe of all the jewelry artists who bead with the little beads...lovely! I had a few 'fail' moments with my soup, too but that's what makes us great designers; we just chalk it up as a learning experience and move on. I really like the way you mixed the two colours in the necklace and what a gorgeous focal! I also love how you made the beaded toggle on" Wilma's" bracelet, too... you really did a great job with your soup. I love the bright, fiery colours of your creations. I'm guessing that fuchsia bracelet is a show-stopper in person. My fave though is Wilma's bracelet - I can totally see her wearing it. It'd go so well with her white dress and Fred's orange outfit. Wonderful job! Souper work incorporating every bead!!! I Love your fun and fresh designs! Great pieces. Love the beadwork. AND, the Wilma's bracelet is perfect!!! I'm so happy Lori partnered us for this soup!!!! my favourite's the polymer clay beads with gold bracelet..! you have some serious bead weaving skills going on.. you must be super patient to weave all those tiny seed beads together! Amazing bead work! Love what you did with that focal and the "Wilma" piece is great! You are surely a very patient person to be able to create such wonders with the tiny seedbeads! I admire your talent :-) The cracked bead bracelet is so fresh and beautiful! Awesome beadwork! I love the orange bracelet! Beautiful bead work! Great ingredients that lead to yummy soup! Love your necklace. What a nice soup! !My favorite is the bracelet with polymer clay beads! Great job with all the components! I can't believe that one focal is polymer clay. I thought it was glass! Love, love, love the dark pink bracelet. This was a really interesting soup! You made beautiful pieces! Love the beading components you made , and the bracelet is beautiful! Great colors and the clay pieces are so cool. I love the beadwork dangles you added to the necklace with the focal piece, great work! Very unique. Your pieces are all attention grabbers. Wonderful vivid colours you have certainly made the most of them with your designs they are really lovely! I love the first beacelet! Seeing your lovely work makes me wish I had the patients to weave beads. You made some beautiful pieces. I love the colors in your soup mix and your creations are wonderful! Lovely bead work! I wish I had the patience to weave seed beads. Your work is so beautiful and inspiring. I love what you did with your soup. I am LOVING orange right now and all your pieces are extraordinary! Fabulous! Wow you really did your bead soup justice I love all three of your pieces. The first necklace is gorgeous I love the verigated herringbone ropes and the peyote shapped dangles that mimic the beautiful focal pendant. The second necklace is very beautiful, those pollymer clay disk are bigger then I thought, love the red with the gold beads. Your third piece is so funky and cool with the crackled pollymer beads and I can just see Wilma showing this beauty off! Wonderful job! I'm always amazed at how diverse polymer can be. You set off the focal wonderfully with your bead weaving. Great necklace! The red and gold bracelet is simply delicious! It all has such a beachy summery feel. I love the first one with its variegated tones. You have a great eye for this. Beautiful! I admire anyone who can weave beads. Your work turn out beautifully! 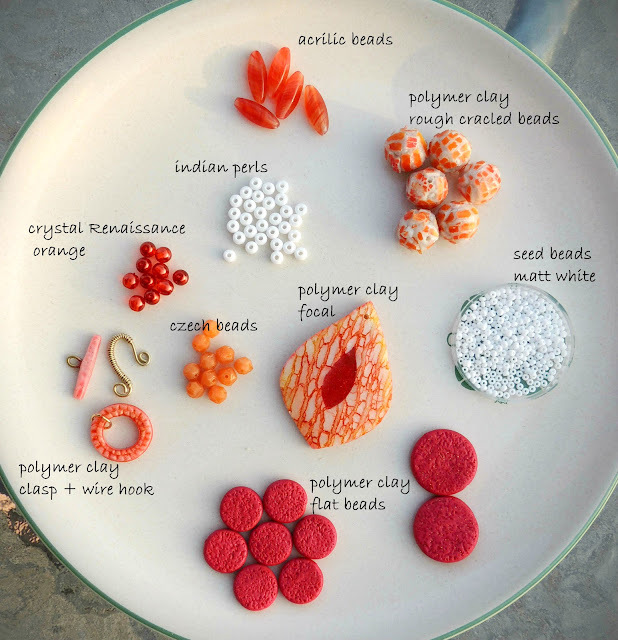 Your beadweaving accents the polymer clay bead beautifully! Beautiful work! I love that Wilma bracelet! Great soup creations! The necklace is my favorite but they are all very well done! That first piece is a stunner, I love the focal. Great job on all your pieces. The colors are wonderful! I love how you made matching pieces from seed beads to mimic the focal -- that made that necklace extra-special! I'm so pleased with what you made!!!! I just love that necklace! It always amazes me that people can work with such tiny beads. I love the Wilma Flintstones bracelet, and orange is a favorite color of mine! Beautiful! I love the orange/coral/raspberry tones in your soup. And the way you combined them in your necklace - natural and exotic and striking all at once. Have you tried Tulip needles? They can make it through tight places and beads that stymie standard beading needles! Yay!! You did an amazing job!!! Love the colors in your soup...you did a fantastic job...they are all beautiful! I do the same thing. I will spend hours trying to pound "a square peg into a round hole" and when I give it up things just fall into place. I love your first necklace and the way your bead weaving mimics the pendant - and yes, we can see the flecks. I also really like the bracelet you made with the last beads. Great job! What great pieces. That is a really bright set of beads and you have set them all off beautifully. I love your pieces. I think my favorite is the Flintstones bracelet, but I love everything. Bright and beautiful! Perfect for summer. I love the bracelet with the cracked beads--fun! Fantastic pieces, I really love that last bracelet, so fun! Your beadweaving goes right along with those designs, great job!! I just love those cracked beads....wow! These are all really great designs, and I can totally tell how much time, effort, and thought you put into each of them. I adore your 'leftover' bracelet. Fantastic job overall though! Amazing beadwork - love what you've done with the focal bead necklace. Beautiful! Love the colors and the beadwork. Beautiful. Love your use of the focal and the clasp! I love your beaded additions to the necklace!! So fun!! What a colorful bead soup...yum! Your beadwork is awesome and your designs, beautiful...nice job! Great use of your soup items. The final bracelet is such a great color and fun design. You created a whole bead wardrobe! Very nice designs. They are all so fresh and pretty. Rockin designz! Great beadwork!!! I luv them all! I always admire seed beaders. I love the pink and gold bracelet! Amy!!! You know how much I love this, right? The Wilma bracelet is soo much fun! Love the necklace, you're right, it lays beautifully. Have to say, my fave is that HOT PINK bracelet! Awesome!! What great colors!! Beautiful designs. Great job echoing that focal shap out of delicas, very impressive. I think Wilma would happily wear any of these pieces! What a gorgeous way to use your soup! I love the necklace! Your bead weaving is beautiful. I really would have been challenge with all that orange, but you pulled it off. Great job. Very nice work! I particularly love those two bracelets...simple and yet so unique. I would love to have congratulated Amy on her beautiful pieces as well, but I couldn't get past her Captcha coding :-( so if you are able to pass along my congrats on hers, please do! Like what you did with the cracked beads. Very pre-historic. You did a great job, colorful beads make great looking pieces and yours are no exception! Beautiful! Thank you for showing some of your working process. I am not that familiar with your way of creating jewelry. You did a great job! The second necklace is very pretty and funny in a way. Love it!!! You beadweavers blow me away. What a cool way to bring the elements together! gorgeous pieces in gorgeous colors... great job. I love these pieces. The color combinations are just perfect and these would suit every summer dress. Kudos to you for these wonderful pieces of art!